Suprasellar lesions are varied in pathology, but are challenging due to the proximity to the optic apparatus, pituitary gland, infundibulum, hypothalamus, and third ventricle. Surgical interventions to remove these lesions may result in visual field loss, endocrine dysfunction, and hydrocephalus. 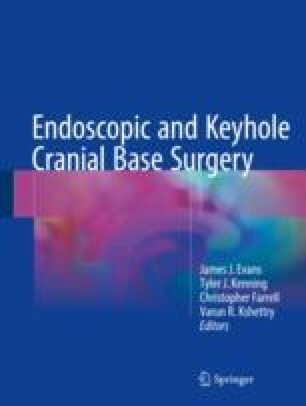 The endoscopic endonasal transplanum and transtuberculum approach is the defining endonasal endoscopic approach to the suprasellar lesions and is the most direct route to the region that avoids manipulation of the optic nerves and carotid artery that obviates the need for brain retraction. Meningiomas, craniopharyngiomas, and pituitary adenomas are common examples of lesions that can be resected using these approaches. These approaches differ from traditional microneurosurgical approaches with the instruments and endoscopic techniques that are utilized. Safety and success of these procedures require careful patient selection and expertise in the endonasal endoscopic method.